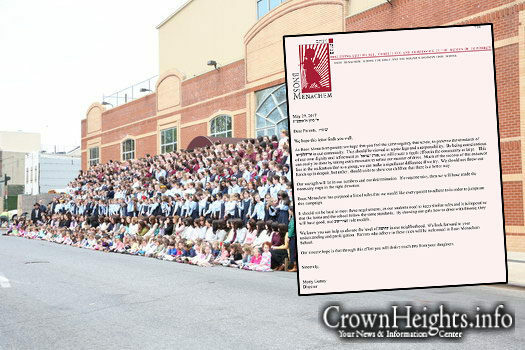 Crown Heights Girls’ School Bnos Menachem sent out a letter yesterday to all parents informing them of new standards of modesty it expects all its students’ mothers to adhere to over the coming school year. “As a group, we can make a significant difference if we try. We should not throw our hands up in despair, but rather, should unite to show our children that there is a better way,” the letter says. 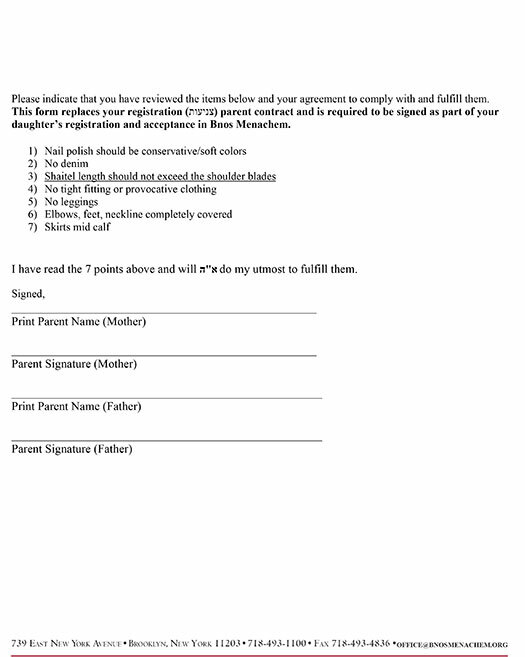 All applications for the coming school year will have to be accompanied by a signed agreement to abide by the rules, which include: not wearing “loud” nail polish, no denim, no long shaitels, no tight-fitting clothing, no leggings, no elbows; feet or neckline showing, and only mid-calf skirts. “It should not be hard to meet these requirements, as our students need to keep similar rules and it is imperative that the home and the school follow the same standards. By showing our girls how to dress with finesse, they will have good, true Chassidishe role models,” the letter says. It’s a private school. Don’t like the rules, don’t send your children there. You a are so wrong. This is no different than Hatzallah strapping an oxygen mask on a patient in respiratory distress. Many women in our community have forgotten that tznius is a biblical commandment. They dress appallingly, with a total lack of self-respect, and we have to stop this terrible disgrace to klal Yisroel. I’m glad at least one school is demanding the students and parents maintain basic halachic standards. I trust this includes the teachers and other school staff as well. Dear Jews, I am non jew from kuala lumpur Malaysia, Instead blaming each other, follow what is torah say…these hatred between you’ll is still going on and we haven’t build the third temple and moshiach is not coming because of all these women and men and different denomination among Judaism. So please see what the torah say and follow accordingly. The people have overstepped their bound with regard to tznius. thats why the Rabbis are doing something about it. MID CALF??? like, yes there will always be mothers who anyways go mid calf but please! this is going way too far! I live in flatbush. A while ago I was sitting Shiva l”a, and was so embarrassed when some acquaintances came from Crown Heights to be menachem aveil! I. Couldn’t believe how they we’re dressed, with low Cut shirts and short skirts, no stockings or socks… These were young married women with children! What happened to modesty, a healthy sense of shame, adherence to Halacha, and good judgment??? I was literally embarrassed for others to see these women in my home, and worried for my sons too. You can deny the appropriateness of this move by the yeshiva, and fight this all you want, but you know the truth is you are absolutely wrong! Lack Of Tznius is a very real, very widespread problem among the women of Crown Heights (last I heard the Torah doesn’t speak about men being prohibited from showing elbows!) Stop denying and admit the truth and do teshuva as the Rebbe ZTL would want!! Does this include the wives/mothers of the rich guys that support the school? Will you not accept their children nor their money if these women don’t sign to comply? seriously, where are you all with the Rebbe’s spirit here? You seriously think that the only way that any place will get money is from gvirim who donate and expect their kids to be able to walk around hefker? What is the use of a school which is devoted to the Rebbe and to Chabad, if thats what we sell out to. That is sooooo cheap and without meaning and or purpose. We Yidden survived Russia and other places, to have this?? Please, HaShem, don’t test us with this attitude. Please write s letter for the standard for the fathers. Standards for the father?! Seriously?! What’s the worst the fathers could dress in, jeans? They’re not the ones showing their elbows, knees, necklines and pregnant belly buttons! I would hope that the Tatties would also wish to have an influence on the tznius of their children. Suggested guidelines for enhanced Tatty tznius. Neat and clean collared shirts, tucked in. Set an example by working, as well as having mesiras nefesh at home. I don’t want to shame a lot of people, but sitting back and accepting charity as a lifestyle is absorbed by kids though they may not say anything. Take your sons to shul in a cheerful manner, not a begrudging way; and know that each child will attend at his best ability, which may not be perfect behavior. I have experienced and seen much abuse, both toward our children and our mothers. Rebbeim have a much larger responsibility than simply issuing dress codes…. Oh puhhhlease! How do u compare ANY of that with women dressing provocatively??? Add no chup/fringe/long hair, no leather jackets, and no mini skirt Kapotes! tucked in??? sorry עד כאן we are not snags . In other words, it has to be longer than that while standing – i.e., mid-calf. Not even a discussion… Women in crown hts are wearing mini skirts! Mid-calf is the minimum length to ensure that your knee is always properly covered (like when climbing the stairs and getting in and out of a car/bus). Perhaps they will next forbid woman from driving in cars that are too loudly colored. People with red cars will have to trade then in for “muted colored” cars. I built this giant man. A giant man made of straw. And burned him into ash. And he was no more. Stop being ridiculous! There is indeed a major problem with lack Of tznius and I dare you yo deny it! Its about time someone in Chabad is addressing this major overdue issue. As an outsider who starting learning Toras Chasidus Chabad i’m appalled see to how low the Tznius Standards are. A community who boasts its self as the True bearer of Toras HaBal Shem should be the example of what Chasidus does to you and the great affects it has on your Neshomo to other communities. you have a some BT syndrom to deal with. coming soon…the Chabad internet asifa! What gives one individual the right to enforce a new community standard? A school director is not a Rebbe. A school director (who is a man, incidentally) dictating laws of modesty for women strikes me as patriarchal and more importantly, as wildly inappropriate and in itself not tznius. If you’re really that concerned about tznius, appoint a woman to regulate the tznius of the school’s parent body. Additionally, why is the onus solely on the women? This is demeaning to both men and women. Something here is very, very wrong. It’s ones choice to send to this school. Mr. Gurary wants the parents of his school to dress a certain way. If you don’t like it, send your kid somewhere else. Where does the Rebbe come into this? NEW STANDARD?!?! So keeping halacha is NEW to you? Boy how the yetzer hara works! It’s a good idea, we support it. It’s asking for too much. It can’t work. When you ask for too much, you don’t even get what you could have asked for. No longer than the shoulder blades? The super long wigs are immodest, granted, but it’s a grey area and this measurement is arbitrary. When you go arbitrary, you lose credibility. Leave this one to the mashpios. Furthermore you’ve ensured non-compliance. These wigs cost between $2000 and $3000, how many do we believe will be thrown out in compliance with this letter? None. Denim? What’s the problem with denim? I mean that as someone whose family is always in tights, with nothing tight fitting, with skirts at mid-calf or below. What is the issue with denim? Tights? What the matter with leggings and socks? If you can’t make inarguable case, it doesn’t belong in a letter like this which seeks to dictate the conduct in and outside the school, for both students and parents. In principle, I support this type of action, but if it isn’t done in oifen hasmiskabel, it’s counter-productive. If you want to make a change and you are willing to go all out, demand only what’s most important and as little as possible. Here’s a suggestion: Just demand mid-calf skirts and nothing tight fitting stuff. And mean it. That’s most the battle right there. When the community reflects that standard, we will already be in a better place. In Villamthboirg, it’s okay. De lydeez dere dress thayur thznius. Suh vy not here in Crun Heights? Ve heff ta make de nyyberhood more frimm! Maybe ve ken make de menner veear thrymuls un big hets too….mit laanger pyyus! I suggest you learn the sugyo first and then talk. You can start by checking up the Mogen avrohom, 75:3. Leggings are. Cometely untzniisdig, the women are wearing them in lieu of stockings, and are being worn under super short skirts! They look like pants and are usually always accompanied by sock-less feet showing the toes. But a mixed dinner is ok?! The mixed dinners and gatherings came about as comprimise. this not yiddishkeit! There can be no compromise of halacha for the sake of Kiruv. This is who we are so come and learn. giving Aliyas to makallel Shabbos people, counting them in a minyan is wrong!!!! very nice . long over due ,, trust me his school will still be full even if some of his parents will fight this , and hopefully on the other side of the door . Who will be enforcing this Rabbi Gurarry? And the beat goes on and on and and on.How about new standards of modest and respecful behaviour to your fellow jew? Nope nope and nope! They should not tell what the parents should wear. Lots of women cover their elbows, knees, and collar bones but still wear denim, long Sheitels and dark or bright nail polish. Sorry, doubt anyone is going to go cut their thousands of dollars Sheitel to their shoulders…it’s over $100 an inch…and there is absolutely nothing wrong with it. As someone who dresses tznius, I feel this is borderline crazy. Focus on improving the school in other areas. This contract will in no way EVER be enforced, because women are not giving up long Sheitels or nice nails. On one hand, it’s their school and their standards. 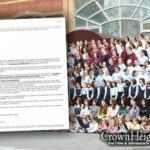 There are enough people in Crown Heights to fill a school that wants to have elite standards in chassidishkeit, and there other schools for people who have different standards. On the other hand, would Rabbi Gurary personally sign a duch to the Rebbe saying they are denying certain girls a chinuch al taharas hakodesh with the highest standards, just because their mothers wear a shaitel that’s below the shoulders or skirt that’s only 2 inches below the knee? I wonder if these rules only apply to mothers of the girls. “[…]it is imperative that the home and the school follow the same standards.” What about sisters? Sisters-in-law? Step-mothers? Grandmothers? Cousins? Cleaning ladies? Going too far!!! I do not feel you can tell someone what color nail polish to wear, not to wear a long shaitel or a tsnius denim skirt, otherwise their child will not be accepted in school. Fathers tsnius – should be addressed too. What is more modest than a denim skirt or jumper? They don’t cling to the body, and tend to obliterate any other evidence of gender. What, that’s not the intent? No leggings under a long skirt? Much more economical than tights which snag and run. It is clear that some man wrote these rules. The problem is it’s usually leggings under a (very) SHORT skirt! Have you honestly not noticed??? Do you know that in Gen Patton’s army a front line combat serviceman was fined if he was not in proper uniform. Having letters like these are counterproductive ESPECIALLY when it comes from a man. Having a dictatorial type of approach may solve the “problem” in the short term, but it will cause a mess of problems long term. And how is having a man ok and tznius running a girls school? THere are so many incredible female role models out there! This also has to be enforced with the teachers and staff! I once asked a teacher (at another crown hts. school) if there was a dress code and if it was enforced, and I was banned from the campus! Unbelievable!!! The teacher was wearing a very tight short skirt (above the knees). But of course I can’t dare say anything. Enforce this dress code in the schools with the staff, teachers and therapists! As R Gurary is the founder of the school he can create whatever rules he deems fit. 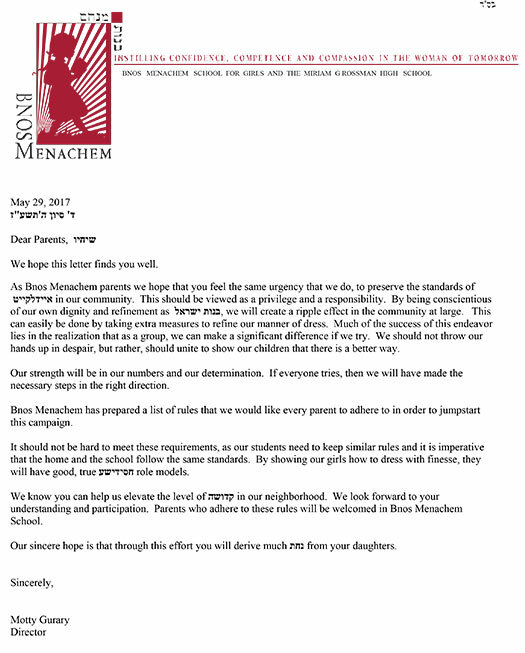 95% of parents at bnos menachem already adhere to these standards , so it wont be hard for them to sign the letter. its about time bais rivka stood up and made some rules of their own as the standard of tzinuis is terrible in crown hts. Half of the people in the school do not go on this standard. They are normal and very upset with the new rules. Where are the rules for Men too? School fully tznius (and a long Sheitel), and I will likely get harrrassed with phone calls at home a few months in that I was spotted wearing a tichel as I hopped out of my home to put my kids on the bus…life will go on. A cat and mouse kind of life. Like a hamster wheel, always being chased until my daughters graduate. Then I will be able to pop out my denim skirts and bright orange nail polish from my closest and call it a day. ….IY”H you will have grown up a bit and won’t feel compelled to wear orange nail polish and denim skirts! If your really a BM parent, your daughter will be out of school in a flash. When there we’re girls in 8th grade that had cell phones (which is asur) the parents we’re called down to school. Girls that didn’t comply, were thrown out. Go ahead. Lie, but don’t cry when your girls see your lack of faith and drop off a bit more than you have. I’m sure you won’t be comfortable with that, just like your grandmother cringed when she saw how you dress! C.H. is growing so fast that we may soon be like some other communities, where there are not really enough desks for all of the children. This fine school has a waiting list. It’s not even a “given” that if you have an older girl already in the school, that your newborn girl will definitely be able to attend when she is of preschool age. This parental dress code letter not happen if there were a surplus of classroom space in our fine schools. Simple economics. That being said, it’s better to allocate scarce openings and limited space by something like this, than by arbitrary things like who comes from the most chashuve family (even if the household has drifted far from what’s upstanding and truly chassidish), or who has the most money (regardless of lifestyle, and regardless that mosdos “look the other way” on their lifestyle due to their wealth). The way I see it–IF the school really sticks to its guns on this and doesn’t ignore it when convenient–this school values chassidishkeit. If a family “dresses the part” and is truly a hypocrite about other matters of chassidishkeit, this will come out, and this fine school will address it appropriately. Finally, a C.H. institution is doing something that doesn’t put BTs at an automatic disadvantage! It’s about time! So what are the “lesser” families supposed to do? Send their kids to public school? since when is a waiting list of sign of them doing something right?! Movie theaters also have long lines to get in! no school is perfect — and must rely on siya’ata dishmaya and the Rebbe’s brachos to succeed — thats why I stay from this school, which relies on neither. 1/ where are the Gemachs to lengthen skirts and shorten shaitels? 2/ I agree with the uniform comment – but are we wearing uniforms next? 1) Excuse me: There ARE gemachs for those women who truly cannot afford to buy clothing for themselves. Why are so many so quick to kvetch that someone else should pay for them to do the right thing? A BT woman who changes her mode of dress does so proudly, at great sacrifice sometimes, rather than complain that there’s no one to pay for her new tznius wardrobe! 2) Be careful when you call a dress code a “uniform” for adults. This is teaching your children an attitude of contempt for Torah standards! 3) I agree that men need a dress code too. 4) There are other places that sell midcalf skirts if there truly are none in Crown Heights, but I think you are mistaken about that anyway. You can always buy full-length and shorten, or order online (if transportation is truly an issue). BUT: If the fashion runways were featuring shorter hairstyles and/or mid-calf-length hemlines, I’m sure that even if C.H. stores and sheitel machers were behind on this, you’d find a way to be up-to-the-minute and have these now-coveted items! take the B44 bus to Bedford Ave and Flushing and walk to Lee or Wallabout. There is a skirt shop called Surales. There is also a very busy sheitel shop called Synthetic Sensations where you could get a shorter wig for cheap. Somehow the ladies in other communities don’t have a problem with tznius and don’t argue with being required to wear it. actually, fashion runways ARE featuring short hairstyles and midcalf skirts. but that doesn’t mean i like it. I don’t wear stuff just because they are in style. I wear things because I like them. And I have a question- If a skirt is longer than midcalf is that ok??!! I’m sorry to say this but you are deluding yourself. You’re not a hero, doing “anything for my little girls”. You’re “keeping up appearances” without being truly honest to ANYONE, including yourself. I think YOU need the Bnos Menachem education, even more than your girls do! A piano “only” has 88 keys, and new, beautiful, attractive, and compelling music is constantly being written. You undoubtedly have your own personal flair, and with that, you can take the “only 88 keys” of tznius and wear it with flair, and with your own personal touches, and be more “you” than your current slavery to pushing-the-envelope at the command of the goyish fashion mavens who live objectionable lifestyles! But the sad thing is that you, too, were taught this concept, and it never really became meaningful to you. You know it’s Torah, but you’d rather push the envelope and rebel against it. This is not good chinuch for your daughters, I am sorry to say! Why not be truly true to yourself and your family, and choose a school where all of the girls’ mothers dress as you do? THAT would be honest. the best thing you can do for your girls is to be a Dugma Chaya. If you lie to the school then your children will learn that it is ok for them to lie to you. Find a school where you can be true to yourself and your children. As director of the school he has to sign this letter.These requirements must have been fully dicussed by committees.It is essential in any place educating young people to request that home and school standards are in harmony to avoid confusion as to the goals we strive for.In UK ,government inspectors praised the unity of purpose shown by parents,staff and pupils in the very enthusiastic education offered.Lasting communities can be built happily when we all “march to the same tune”.Wishing much nachas to everyone in this fine school. Money I told him you act like a private school and don’t really care for all the community children and I will not be part of that. It works in other communities. .let’s hope he keeps his word…. HAHAHA Have you been to “other communities”? Chitas everyday, Rambam, hats and jackets when outside of the home, eat only lubavitch shechita, go on mivtzoyim weekly, only wear white shirts, be groomed, wear only black terylene Yarmulkahs, minyan 3 times a day, set aside time for learning everyday, give 20% maaser and not go on pesach programs unless you are making all the food yourself. I am first to admit I am totally lax when it comes to tznius, but I do not see a problem with this. Just like any school contract, it has stipulations. This is not something being forced on anyone, since there are other options on where to send your kids to school. But since one is choosing a frum lubavitch school, it makes sense that they only want a certain type of clientele. Just like non jewish private schools have even more stipulations. The only problem I see is that there is nothing about the men’s tznius. If they came out with a men’s dress code as well, this would not seem as such an attack on women. Also its funny I was just saying how I miss the 90s when everyone wore the long denim skirts rather then these see through pencil skirts that are in fashion now. For all those who would like to learn a bit about the lengths of the hair and Sheitlach. It is written in Shulchan Aruch, “Lo teilachna bnos Yisroel pru’os rosh b’shuk, achas penuyah v’achas eishes ish,” Jewish daughters should not go in the street with their hair uncovered, whether they are married or single. Does this mean that single girls should cover their hair? Some take it quite literally and assume that single girls should also cover their hair. However, the vast majority of poskim reject this interpretation, and the halachah follows their view (that single girls need not cover their hair). One interpretation is that the Shulchan Aruch is referring to currently single girls who were previously married, such as widows and divorcees. Indeed, that is the halachah: any woman who was married is required to cover her hair. According to another interpretation mentioned by some poskim, the Shulchan Aruch is referring even to girls who were never married: they are not allowed to be pru’os rosh, but in this context pru’os rosh refers to hair that is loose; they have to have their hair tied back. While these poskim do not specify a particular length, it is common practice that hair which is somewhat longer than shoulder length should be tied back, at least partially. According to all opinions, if the loose hairstyle is untzniusdik (immodest) by being overly attention-getting, it is unacceptable. This includes exceptionally long, loose hair, as well as hairstyles that are fluffy, wild, and unkempt. The same applies to a sheitel: if it is long it should be tied back, and most certainly if it is exceptionally long, or gives a not tzniusdik impression. The Midrash tells us that Hakodosh Boruch Hu, the Aibershter, brought Chava to Adam HaRishon only after He had braided her hair. Some sefarim explain according to Kabbalah why it is important for women and girls with long hair to tie their hair back. Where is THAT “gezaira shava ” from?! About 2 years ago our beis din put out a pamphlet on tznius for women. Nothing was said against denin skirts and mid calf skirts or what color nail polish to wear etc. If you want to make such rules please consult our own beis din or at least a rabbi first as to what the halacha really is. Also the rebbe has spoken in fabrengen about laws of tznius for men as well. Forcing women to sign a tzinious contract to have their daughters in a school is not only unhelpful but will only make matters worse. The Rebbe taught us long ago, halacha should be taught with love, not with forced contracts. Lo Zu Haderech, v’Lo Zu Hair! Tznius needs to be conveyed with kindness, not taliban enforcement. Why not simply wear a Burqa or a Hijab? this exceeds all the modesty required to make it Jewish put a Meshiach flag on it. Make sure it’s not denim! The teachers and staff do not wear midcalf skirts. They dress like the Rebbe said a skirt below the knees when sitting. Will they make the entire staff buy new skirts and cut their shaitels for next year?? Actually there are many letters from the Rebbe that tell us to look at the way a bais yakov girl dresses for tznius rules.. I can’t wait to see all the father’s in mid calf skirts! Is it so bad people want some eidelkeit in the rebbes schuna ? My girls go to a school that has had these rules since they opened. Following our Rebbetzen. This is one of the reasons this school was opened in the beginning. If a teacher or a parent does one thing in school and another standard on the street, whatever that student has learned goes out the window. Kids see thru hypocrisy. Proud of our school and now others are waking up and following our footsteps. built for the wrong reasons as is evident by their admissions policy which flies in the face of the very spirit of the values they purport to champion. It might look sincere at the surface, but it cannot be, being that it stems from an institution who entire raison d’etre is a claim that “they are better” than a moisad — no matter how flawed — of the Rebbe’s. (See Rebbe’s letter to Nissan Nemenov re the Lishka and the Matzos they offered for sale.) Shame on the school’s admin. As an added proof, if the intention were pure and intended to portray איידלקייט it would have been authored by a woman. So inappropriate for a male to send out a letter on how women should dress. Where is the fathers dress code? My sister,who ,lives in Israel,said some Jewish women actually do wear burquas to be more tzniyus. Thank you for responding- it’s me again. And I am a bt. When I became Frum I went into the local goodwill and bought two illfitting skirts and wore sweaters all summer. If I did that now I would be locked up and my kids taken away. Tuition is a fortune so any bit of help helps. It isn’t entitlement- it is a help up. I do not run after the latest styles either. The people who run the Gemach’s in crown heights are tzadekises. However the clothes aren’t new – they are things someone wanted to give away. We make it so easy for people to keep kosher in crown heights. So many places with such great hechshers. If we treated tznius the way we treat food – the level would surely rise. No one would sell pig 🐷 in our restaurants just because the non Jews are their biggest customers – but recently I saw miniskirts at a women’s store. I need to go online or to the mall to find tznius clothes. there is NOTHING in crown heights. No shirts that dont need a shell, and hardly any skirts that are tznius- if they are than theyre shabbosdik and not good anyways. Always picking on the ladies! Well I’m sure there are plenty of men who can improve in the tznius department too. My main complaint is the big pants thingy and I’m not referring to teenage boys wearing that style. Far too many adult men wear their trousers way too big and even with a belt they always seem to be pulling them up lest they fall to the ground thereby embarrassing themselves and shocking everyone else. All people should wear appropriate clothing in the correct size. To clarify why many parents find this upsetting: we have made a time and financial commitment over the past years- accommodating a 11k pp tuition and working so that our daughter’s comply with the school and thrive- just as people at other schools do. It is upsetting to have the rules changed and to be given an ultimatum after investing our resources here. To those women who hold by these standArds and fine it necessary to tell us other mothers to just deal and shut up bc it’s his school- I have a feeling if you look closely as yourself you would realize that there are things about you that are not to RG’s standard and he could and will eventually find them and hold you to. Finally someone is doing something. All the people who are complaining…. do they REALLY think they are right? It’s his private school and he should be applauded for.taking a stand which Bais Rivkah cannot do unfortunately. I am sure that if Bais Rivkah wouldn’t be the official community school.they would be able to take a firmer stand. If you don’t want to abide by their.standards you don’t have to.go there! unfortunately mental illness has set in , power goes to the head and destroys our children ,how many will be lost because of these very sick rules,however what do you expect we don’t have a single soul to learn proper behavior, its the blind leading the blind,heaven help us all. As a pant wearing card holder in CH I actually have no issues with the rules. You don’t like it , don’t send your kids there. Why are men who send their kids to the school allowed to wear jeans, trimmed beards and trendy styles. Why aren’t there rules for the men? Or is that letter coming soon? Let’s start with putting a man’s name (yes, yes, all the explanations!) on a letter solely focused on women’s bodies. Really aidel, eh? And what about the more ‘superior’ people – including this esteeemed school director – who, upon meeting someone their gaze goes immediately – no, not to the eyes – it goes immediately down the woman’s body. Yup, another example of true ‘aidelkeit’ (and, yes, this happened to me when I came to talk about my daughter – his eyes went down my body, to check that I met his approval in my dress) – really chassidishe eidelkeit! OK, and now we can move along to the real truly ‘aidel’ quality of shaming. Putting people down with a literally withering look. Really aidel – especially when it comes from a man to a woman. Yes, you’re the owner of the school, and you get to decide what you want to do with your school. But please please please please don’t cover your obsessions with little girls bodies by saying it’s all in the name of ‘aidelkeit’!!!! Why do you think he was checking out your tniuskeit when looking at your body? He keeps a tape measure to inspect if the skirt is mid-calf. Does he feel the shoulders if they are padded when deciding sheitel s past shoulders? Graduates of BM are not more tznius than graduates of BR. We did a survey at several events, interviewed dozens of girls, out of school and still in school, and found that the only difference is the level of deception – more of it in BM among the girls still in school. Can the admin provide halachic sources for all the things mentioned? 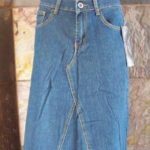 Where does the shulchan aruch say ‘midcalf skirts’, no denim, sheitel above shoulder length? Adding halachos that don’t exist purely from one’s own hergesh is treading dangerous ground. Why is there no Rav’s haskomoh with sources to these rules? As already pointed to above, see the mogen Avrohom 75:3. See also in kevudo bas melech in the back, in the hosofos, he has a few pages in Hebrew on the topic. In addition, plenty of chabad rabbonim have printed piskei dinim in this regard over the years. Wow I can’t believe some. Of the comments I’m reading here from so many who are brazenly unashamed to be defending wearing untzniusdig clothes (and I don’t mean nail polish and shaitels, I refer only to the mini skirts, short sleeved tops and cleavage revealing clothing)! Can anyone Really defend that??? And if you’re honest you’ll admit this had become the norm in crown heights! It’s appaling, and completely k’neged halacha! Bravo to the yeshiva! I really hope it makes people wake up and start doing the right thing! In regards to the Sheitlach, as written above see the Mogen Avrohom 75:3. In addition see what i brought above from Rabbi Braun’s daily halocho. In addition multiple lubavitch Rabbonim have written this over the years. Most of them i personally heard from Rabbi Marlow. Pitty that by us there is no seforim going over that.Might be a ripe time for CHBD to write something about it, not only a school principle. Rabonim decide on that. Thats usually how halocho works, last time i checked. Actually there is a sefer out on the topic, it is called kevuda bas melech. Check it out with all the extended topics in the back. What does the Magen Avrohom have to do with length of sheitel? He is talking about single girls putting their hear in a braid and not married women’s sheitels. The Alter Rebbe omitted this from the Shulchan Aruch Harav and you do not find anyone in Chabad keeping this. In addition, it doesn’t mention anything about the shoulder length. More than that, 90%+ of Chabad women including have sheitels that go past the shoulder. A ridiculous chumrah that sounds like shariah law. None of the respondents were able to quote any reliable source except point to a sefer that itself is a not a source; only a melaket of other seforim. Have you ever seen the Gurary children dress? This is the reason our community looks the way it does, people get turned off. My daughter tells me he lines them up in the classroom and looks them all up and down and how he stares at them. This is so gross. that is the most disgusting thing ever. is it even legal? May I suggest people think twice and reread their comment before posting on a public site. Some of these comments are so full of anger and viciousness…. i understand there are certain standards of tznius that are very important, but what about the eidelkeit of a person? what about middis tovos?why is this not stressed as well? just as important!!! how come when you see a bais yaakov girl in the street, she looks frum and eidel? you can tell a CH girl (and woman as well) in the street anywhere and they look prost, opposite of eidel even if the skirt is the correct length? How about giving priority to the families who struggle with Tznius and put the already Tznius families on a waiting list? Do you think that is how the Rebbe would do it? Reach out to those who need to learn Chassidus? Only there would be no waiting list. The Rebbe would make sure everyone gets a place. Dressing modestly is not the only Mitzvah. I think educators would do well to relax about Tznius and teach interesting, engaging topics. The students will want to learn more and do more and eventually the Tznius will come… even if the mother is still sinking in the quicksand of the Yetzer Hara. On the one hand, Bnos Menachem has a point. The standards in Crown Heights for Tznius have fallen too low. It has become normal to walk aroun with jeans under dresses and short sleeve shirts. Banks Menachem is standing yo and taking action for what is right – which is to try to raise the standards of Tznius on CH. For that I respect them. On the other hand, these rules seem a bit far fetched. Not allowed to wear shaitels passed the shoulders is to much. Since when is having hair past shoulders untznius? Someone can be completely tznius and aisle and het still wear dark nail polish one doesn’t take away from the other. All in all, Bnos Menachem is bringing up an important point but maybe it doesn’t have to be brought up in sih an extreme way. Can the Men wear denim? This is a private school. No one is forcing you to send your daughters there. Motti Gurary, read this. And then read it again. And then hide your face in shame! yes, this is a private school that can do anything they want. But can they really claim that this forced contract is the chassidishe approach? Is there anything concrete you can share about your assertions? Would be very telling if true..
All valid points. If this were written by a woman you respect would you agree with the content? There are many women in Crown Heights who maybe dress this standard even though their parents did not. If the teachers and staff set a good example with tznius and act with derech eretz towards the students, it can have the biggest influence. Most children are not influenced by how their parents dress anyway. It is clear that there are many upset with this. Crown Heights needs more achdus. Bnos Menachem is a place of individual growth and learning. The students who go there are very lucky. I have much respect for the staff. How about stocking? I heard from Rav Dvorkin that stocking must be opaque (not being able to see through). In addition, I heard from Reb Yael Kahn that the Rebbe spoke a sicha about the importance of women wearing stocking in the early years. Ohlei Torah was not meant for every child, only for those that did not want the american modern culture. YES, it is CRAZY not to learn english!! but those that wanted sent there. if you want these standards of Tzneuis then send to BM, if not DONT!!! It is a private school! You can wear whatever you want and i respect you and your standards, just dont send your daughter to to my daughters class, and complain about the standards, and try to lower them. Its like going into a Pizza shop and complaining that you are lactose intolerant and they should respect your standards. Respect us and let us have our standards the same way you are screaming about us respecting you and your standards. Go to a place that fits your standards. why are the more chasidish always blamed for not respecting others standards??!! about time you respected our wish to have higher tzneuis levels!! Rabbi gurary, VER NISHT NISPAEL!!! Whether the school policy is L’shaim Shomayim or not, is one thing. But regardless of if the intentions are being soley for the sake of heaven, the school director does have a right to make rules in his school. Yes even if you don’t like and it doesn’t make sense to you. Also M’toch Shelo Lishma Bo Lishma. One thing is for sure, if there’s a Tznius crisis going on, something must be done!!! Now there is Halacha (Torah Law) and there are Takanos And Rabbinical Fences. Rabbinical Fences could sometimes be just as important as the actual Halacha, because sometimes we need the fence to keep us away from something. Although there will always be differences in what’s considered “more” appropriate, one thing is for sure, Torah true Jews dress differently. And Frum women should not look like models. If your read the Shulchan Oruch, you’ll see how much more Tznius is required than just Shaitel and skirt lengths. There’s much more!!! But unfortunately we have deviated big-time from what we’re really supposed to be doing, and now someone hearing that you can’t have a long shaitel is like “wow this is crazy, what else do they want from us? ?” But unfortunately that’s all from being influenced by the outside world. We’re a special nation, and it’s sad that people think that asking and enforcing Tznius is such a burden. How low have we fallen??? Every women ( and man ) who is trying to do the right thing knows that today’s accepted clothing is so provocative that’s it’s pathetic. Shaitels are meant to cover ones Natural hair because it’s forbidden (yes forbidden!) for a man to look at another womens natural hair. And to wear a Shaitel that looks 10 times nicer and longer than a women’s natural hair- does that make any sense??? Remember one thing. That even if it will take you 20-30 yrs to be on the level of being as Tznius as you should be, Never ever justify immodesty. Right is right and wrong is wrong. Period. Men have Tznius to keep up to also. It’s definitely much more relaxed with men, but there are definitely guidelines. But the good news is we can be better. A tiny bit better in our modesty, in our honesty in business, in trying not to speak Lashon Hora and Vulgar speech, in not talking during Davening, in Learning a drop more, in Giving a drop more Tzedaka, in being a bit more careful about making a Kiddush Hashem, and preventing a Chillul Hashem, in slightly improving our Bein Adam Lachavero, in increasing our levels of Kedusha slightly, in being more careful what we eat. We are a truly special Nation! The Am Hanivchar! And Baruch Hashem there are so many incredibly good things that we are doing. Every Mitzvah we do changes the world! But we need to keep going. We Can do this! Let’s make this world a Holier place and watch the world be amazed and eventually follow our direction. I also used to get really annoyed when men commented on tznius…I’ve finally come to realize that of course they should – it’s the men who know what is “improper” for them to see!! Women do not have the same understanding of how certain things are a problem for men! And yes, women get an aveirah for causing a man to have sinful thoughts..
BTW the gemara, Rambam, Shulchan Aruch etc..are all written by men. And you want to know why people are leaving Yiddishkeit!!!!! If I go to visit near the school in jeans and a tshirt and no hat should I expect to be stoned? I’m not from CH & my children attend a Bais Yaakov & I had to sign a similar letter. These standards aren’t just about covering up but about being tznius in dress & action. About looking like a bas Melech. A bas Melech is refined & dresses with class. The queen of England doesn’t wear denim or leggings. Bright nail polish is attracting & loud & not refined. The sheitel length is stated as “shoulder blades” not shoulders . That’s pretty reasonable & aidel. To the mother who would do anything for her kids…do something hard. Go trim that sheitel! Midcalf? Meaning the skirt should cover the knee sitting or standing. That’s a minimum & automatically will qualify. Why are you people protesting so loudly? Do something hard , go the extra mile . If you want your daughters to grow in their yiddishkeit let them see you say “I love my sheitel but you know I’ll still look great if it was 2 inches shorter & although it’s hard for me I’ll get it cut”. אין שום מקור לגדר של “עד הכתפיים”. זאת המצאה של מאן דהו. והנה יש שהביאו ראיה שסתירת שיער היא פריצות, שבסוטה מצינו שהכהן סותר קלעי שערה, ופירש רש”י (סוטה ח.) “סותר קלעי שערה, מרבה בגילויה שסותר קליעתה”, עכ”ל. והיינו שסתירת קלעי שערה הוא הדגשת הגילוי ביותר, והדגשה זו היא פריצות. אולם אין זו ראיה כלל, כי שם מוכח רק שסתירת קלעי השיער הוא הדגשת הגילוי, אבל לא מבואר שם ענין אריכות השיער, והאם יש הבדל בין שיער סתור ארוך לקצר, וכמה הוא שיעור האורך המותר. וא”כ, מנלן לחלק בין פאה ארוכה לקצרה, כשכל אופן היא פרועת ראש ואין שערותיה קלועות. ובפרט ששם עיקר הענין הוא לפרוע ראשה ולנוולה, ולא רק להתיר קליעתה, ואין זה דומה לפאות זמננו שהן במראה מסודר. “ובענין פאה נכרית לאשת איש אי שרי או לא, הנה לפי מה שכתבנו שכל הטעם של כיסוי הראש הוא שלא תיראה מנוולת, וא”כ בפאה נכרית הרי היא מקיימת מצוות הכיסוי שאינה נראית מנוולת, ואדרבה פאה נכרית הרי היא כקליעה, ובקליעה כבר הבאנו ראיה מהגמ’ לעיל דזה נוי לאשה והיפך מניוול. ואף שמשמעות כמה ספרים נראה שטעם כיסוי הראש הוא כדי שלא להראות יופיה, הנה הוא טעות גמור, ומזה יצא להם שאם היא לובשת פאה נכרית יפה זה עוד יותר גרוע, וההיפך הוא האמת. והנה כתוב מפורש בגמ’ (שבת צה.) ויבן ה’ אלהים את הצלע, מלמד שקילעה הקב”ה לחוה והביאה אל האדם, ע”כ. הרי דהשערות כשהם קלועות הוי נוי, והרי היא מקיימת שני דברים, גם כיסוי הראש וגם שתיראה נאה, וכמו אלה שמכסות ראשיהן במטפחת או בכובע, וכידוע שגם באלה יש מכל המינים, יפים יותר ויפים פחות, ובוודאי שלא יעלה על הדעת לומר לאשה ללבוש מה שפחות יפה, וכל אשה עם הטעם שלה, והרי כל בנות ישראל בנות מלכים הן וראויות הן לאיצטלה היפה ביותר”. ועוד כתב, “ואף שיש פאה נכרית כזאת שבאמת האשה נראית בהם מנוולת על ידה, באופן שהשערות מפוזרות לכאן ולכאן ולכל ד’ רוחות השמים, מ”מ הרי את ראשה היא כיסתה, והרי היא כלובשת בגד שמנוול אותה [שהרי אין זה שיער מחובר], וזה לא נוגע לדין כיסוי הראש”. ◄ וכן כתב הגאון רבי יהודה שיינפלד שליט”א בשו”ת אוסרי לגפן (חלק ט’ עמ’ קע”ה ואילך), וזה לשונו: “נפק”מ למעשה משיטת המג”א וסיעתו, דאסור גם לבתולות לילך בשיער פרוע… וכפשטות השו”ע באה”ע, ולכן אוסרים על הנערות לילך בשיער ארוך המגיע עד הכתפיים ואינו אסוף. ויש להפליא על זה, שהרי המג”א לא חילק בין שיער המגיע עד הכתף ללא מגיע, ומה שנזכר ברש”י (כתובות טו:) ששערה פרוע על כתיפה (דכנראה משם לקחו גדר זה) כוונתו רק דכן הדרך כשסותרים הצמות, שמתפזר השיער על הכתף, אבל פשוט דגם מי שלא היה שערה ארוך כל כך, כשסותרת הצמות נקרא פרוע, וממילא כשפוסק השו”ע שלא תלכנה הפנויות פרועות ראש, אין חילוק בין ארוך לקצר, כל שהוא פרוע ואינו קלוע כצמות (או עכ”פ קשור יחד, שקוראים קוקו) אסור, ומה ההיתר היום. ואפשר דסבירא להו, דלעולם השיער אין בעצמותו ערוה (עכ”פ בבתולה), רק מנהג צניעות, והכל לפי המנהג, והמנהג כיום כעין פשרה בין המג”א לח”מ וב”ש ודרישה”. עכ”ל. ◄ וגם בדבריו צריך עיון, כי לא תירץ בזה כלום, ועדיין לא מובן כלל מהיכן לקחו שבתולות או נשואות בפאה נכרית אסורות לצאת באופן שהשיער ארוך מן הכתף. ולדרכו של ה”שבילי דוד” שפאה נכרית נפוחה אסורה משום שמבליטה את הלובשת אותה וגורמת למשיכת תשומת לב יתרה, לכאורה הוא הדין גם לאורך הפאה, שאם היא ארוכה באופן מוגזם ויוצאת דופן בין הנשים, הרי זה פריצות, אבל אם ארוכה באורך סביר כפי שנפוץ היום בין הנשים הכשרות, יהיה מותר לשיטתו. ◄ וראה בדברי הגאון רבי שלמה הס זצ”ל, מגדולי הונגריה, בשו”ת “כרם שלמה”, שכתב ליישב את הגמ’ בכתובות (סו:), ש”נתעטפה בשערה” איירי בפאה נכרית, וכדבריו כתב הגאון רבי יהושע שלמה ארדיט מאיזמיר, בספרו “חינא וחיסדא”. ולדבריהם, בוודאי לא מדובר בפאה קצרה, כי לא שייך בה כלל “נתעטפה בשערה”. ◄ ומה שהמג”א אסר לבתולות ללכת בשערות סתורות, הנה האחרונים חלקו עליו בענין זה והתירו, והביאם הגר”ע יוסף בשו”ת יביע אומר (חלק ד’ אה”ע סי’ ג’), שהעתיק את דברי המג”א וכתב ע”ז: “אולם בשיטה מקובצת (כתובות טו:) בד”ה וראשה פרוע, כתב וזה לשונו, פירוש: מגולה, וכך היו נוהגין לבתולה ולא לאלמנה. והא דאמרינן לקמן (ע”ב) ופרע את ראש האשה, מכאן אזהרה לבנות ישראל שלא יצאו בפירוע ראש, י”ל דבנשואות קא מיירי. מליקוטי הגאונים. ע”כ. ומוכח דבתולה שריא לילך בפירוע ראש אף בשערות סתורות, דבכל גוונא קאמר. ורק החילוק הוא בין בתולה לנשואה. וכ”כ המחצית השקל באו”ח שם, שהמנהג שהבתולות יוצאות לרה”ר בשערות סתורות מקליעתן. וכ”כ המגן גיבורים. וכן ראיתי להישועות יעקב באה”ע (סי’ כ”א), שכתב להוכיח במישור מדעת השטמ”ק שאין חילוק בין סתורות לקלועות, ושאף שהמג”א כתב לאסור בסתורות, העולם נהגו להקל ויש להן ע”מ שיסמוכו. ע”ש. ופוק חזי מאי עמא דבר, שאפי’ אצל החרדים לדבר ה’ הבתולות הולכות בפרוע ראש ובשערות סתורות. ולכאורה י”ל שאף המג”א יודה להקל במקום שנהגו היתר בדבר”. ◄ והיחיד שנתן הגדרה ברורה לפאה פרוצה, הוא הגאון רבי משה שטרנבוך שליט”א בשו”ת דת והלכה סימן א’, שכתב שאין שום הגדרה ברורה לפאה כזו: “קשה לתאר או לפרש כללים באיזה אופן הוה פריצות או לא, והעיקר שלא לעורר תימהון, וכגון שערות ארוכות ומסולסלות דהוה כבגדים אדומים שאסרו אז חז”ל, דהוה פריצות שמתבלטת יותר מדאי. וכן כאן אי אפשר לקבוע בזה שום כללים, אלא דבר אחד יש לזכור תמיד, שבצניעות פשוטו כמשמעו שלא תתבלט בתיקון שערותיה שיסתכלו עליה דוקא”. ממילא י”ל שרק פאה ארוכה באורך מוגזם ויוצא דופן, אסורה, כדין בגד אדום. ולאו דוקא “עד הכתף”. ◄ ומאחר שפאה הרי היא קישוט חיצוני ואין היא שערה הטבעי של האשה שאסרה התורה, יש להביא ראיה להיתר הפאה מהא דאסור להסתכל בבגד צבעוני של אשה, דאיתא בגמ’ (עבודה זרה כ:) “ונשמרת מכל דבר רע – שלא יסתכל אדם באשה נאה ואפילו פנויה, באשת איש ואפי’ מכוערת, ולא בבגדי צבע של אשה… א”ר יהודה אמר שמואל: אפילו שטוחין על גבי כותל”. וכתב רש”י, “לא בבגדי צבע של אשה – שזוכר את האשה כמו שהיא מלובשת בהן שמייפין אותה ומהרהר אחריה” (וראה עוד ביבמות (דף עו.) “אמר אביי: מעברינן קמיה בגדי צבעונין”, ופרש”י: “בגדי צבעונים של אשה, והוא מהרהר באשה ונקרי”). ולמרות שזה גורם הרהורים ומייפה את האשה, וגם האשה לובשת זאת בכוונה שיסתכלו בה הגברים (כדכתב רש”י בפרשת ויחי עה”פ “בני אתונו”: “וצבעונין הוא לשון סותה שהאשה לובשתן ומסיתה בהן את הזכר ליתן עיניו בה”), לא אסרו לאשה ללבוש בגדי צבע, וכן הביא הבית יוסף (או”ח סי’ תקכ”ט): “ובפרק ערבי פסחים (קט.) תנו רבנן, חייב אדם לשמח בניו ובני ביתו ברגל… ר’ יהודה אומר אנשים בראוי להם ונשים בראוי להן, אנשים בראוי להם, ביין. ונשים בראוי להן, תני רב יוסף בבבל בבגדי צבעונין”. וחובת הגבר הוא שלא להסתכל בזה. ורק בגד אדום נאסר ללבישה, מפני שהוא בולט לעין. “אשה מותרת לצאת בבגדי צבעונין, אף שמדינא אסור להסתכל בבגדי צבעונין של אשה, אפי’ בתלויות בכותל… וכן ביו”ט משמחה בבגדי צבעונין, ולא אמרו שצריכה להתלבש בחוץ בבגדים שחורים. וכל הפרק במה אשה יוצאת המדובר באיסור יציאה בשבת בתכשיטין, משמע דבחול שרי ולא חוששין להסתכלות, דלאו ברשיעי עסקינן שמסתכלים בכוונה על נשים”. עכ”ל. ומשמע בהדיא מכמה פוסקים שאין נפק”מ באורך או במראה הפאה. ◄ הגאון רבי עזריאל הילדסהיימר זצ”ל (שו”ת רבי עזריאל חלק ב’, אה”ע סי’ ל”ו), כתב: “עתה אני שואל איזהו גבול ישימו בארוכת ורחבת הפאה, אתמהה”. ◄ והגאון הספרדי רבי עובדיה הדאיה זצ”ל, חבר בית הדין הרבני הגדול בירושלים וראש ישיבת המקובלים בית אל, בשו”ת “ישכיל עבדי” (חלק ז’, אה”ע סי’ ט”ז), כתב: “בדין פאה נכרית לנשים נשואות, אם דינה כמו שיער ראשה שאסור לגלותה משום הרהור, דלפעמים היא יותר יפה משיער ראשה ומייפה אותה יותר, ואתי לידי הרהור, וכן משום מראית העין, דהרואה נדמה לו שהן שערותיה ממש… קים להו לרבנן שאין יצה”ר שולט אלא בדבר הדבוק בגוף האשה עצמה, היינו הדבר הדבוק בגוף הערוה עצמה, דאין שליטה להיצה”ר אלא בדבר שיש לו נפש חיונית, לא בדבר שאין לו נפש חיונית, ולכן בנתלש מגוף האשה, דניטל ממנו נפש החיונית, הרי פקע ממנו אותה הערוה שהיתה עליו בזמן שהיה דבוק בגוף האשה, דהרי הוא כפגר מת שאין להיצה”ר שליטה בו”. ◄ וכן כתב מרן הגאון נר המערבי רבה של יהדות מרוקו, רבי שלום משאש ראב”ד ירושלים (שו”ת תבואות שמש אה”ע סי’ קל”ח): “לא אסרו חכמים לאשה שתתייפה כל מה שתוכל, רק שיהיה בהיתר, ועל האנשים לשמור עצמם שלא יביטו בהם. ואם באנו לזה, הלא כמה נשים יפיפיות שאפי’ יכסו ראשן במטפחת ובצעיף, הלא רק מחמת רוב יופיין יש גירוי יצה”ר, האם נאסור עליהם לצאת לשוק או נאמר להם לכסות פניהם כגויים כדי שלא יביטו בהם אנשים. וגם ישנם היום הלובשים איזה כובעים או מטפחות על ראשן יוצאים מן הכלל ובוחרין בזה יותר משערותיהן ויש בזה גירוי יותר מהשיער, האם נאסור להם? גם צורת המלבושים של היום נשתנו, ואע”פ שמותרים ע”פ הדין, יש בהם גירוי יצר שמייפין האשה מאד, האם נאסור להם? אלא ודאי כל מה שהוא מותר ע”פ הדין, בין אם תכסה בבגד, או בשיער, העיקר הוא שלא יהיה מגופה, הוי ליה מלבוש על ראשה, ואין לנו להיכנס אם הוא מיפה אותה או לא, דזהו ענין הגברים שחובתם שלא להביט, ואפי’ תהיה מכוסה בכובע אין ראוי להביט”. ◄ וכן כתב בתורת מנחם להגאון מליובאוויטש זצ”ל, בדרשה שנשא לפני כשישים שנה (תורת מנחם חלק י”ב עמ’ קפ”ח, שיחת ר”ח אלול תשי”ד): “פאה נכרית הוא ענין שנוגע לבנים ובני בנים, לפרנסה ובריאות, כדאיתא בזוהר, שהדבר נוגע לבני חיי ומזוני… ובפרט בזמננו, שאפשר להשיג פאה נכרית בכל הצבעים, והיא נראית יפה עוד יותר מהשיער שלה עצמה, תתבונן האישה בעצמה מהי הסיבה האמיתית לכך שהיא אינה רוצה לחבוש פאה נכרית אלא מטפחת, כיון שהיא יודעת שבנוגע לפאה נכרית אין ברירה להסירה… מה שאין כן בנוגע למטפחת יודעת היא שיש לה ברירה, שביכולתה להסיטה למעלה יותר ויותר”. ◄ וכן הביא בשמו הגאון רבי משה וינער שליט”א בספר “כבודה בת מלך”, שיש להעדיף פאה על מטפחת, אפי’ אם הפאה יפה יותר מהשיער הטבעי של האשה, וביאר זאת בתשובה שהשיב לו וזה לשונו: “הרי זה (שיער עצמה) פריצות ע”י גופה, וזו (פאה נכרית) ע”י דבר זר (דלבוש הראש דומה ללבוש הרגל וכו’)”. ◄ העולה מכל זה להלכה: בוודאי ראוי ונכון להתרחק מהפאות הארוכות מאוד, ובפרט שכיום נוהגות בזה דוקא הנשים שאינן מקפידות כ”כ להלכה, והנוהגת כך נחשבת כאינה יראה. אולם אין להטיל דופי באותן הנשים ההולכות בפאה ארוכה. וגדר עד הכתפיים הוא המצאה של מאן דהו ללא שום תוקף הלכתי. You are getting it all wrong! this is for your benefit and the benefit of your children and grandchildren> The buck must stop somewhere there is NO guidance in Chabad and in CH in particular . Kudos to the rabbi good work Hashem is with you. I really do not understand anybody having a problem here. These are basis-very basic-standards that even litvakes in Flatboosh and Lakewood adhere to. We chasidishe yiden can not???? Protest…lets see how your your daughters stay in the school…. Why doesn’t anyone comment about Bais Chaya Mushka which also has these standards? Give Rabbi Gurary credit for publicizing the real standards to strive towards that would make the Rebbe proud. Lubavitch is inclusive and accepts everyone. It does not mean that every Lubavitcher represents the Rebbe’s standards! I applaud Bnos Menachem for taking a public stand on the issue so that when the Rebbe returns to us shortly… he will recognize his chassidim! It wouldn’t be necessary to police women’s bodies if they kept tznius. Fact is the school is doing something right. There is a line out the door of applications yet there is no space. Even if you’re tznius to the hilt. what is wrong with teaching girls the proper way to keep tznius? It would do you alot of good if you would sit down with a shulchan oruch. If this is what you consider yourself, or call yourself then listen to the cry of the Rebbe, already over 30 years ago. He was the one who instigated this whole approach, that yes! schools and those that have the power/authority should take tznius at its helm and encourage/influence all women. It is shocking how we sometimes hear/derher only that which sounds pleasing and approachable to us. “Every year before the summer, generally at the Yud Bais Tammuz Farbrengen, the Rebbe would speak about Tznius”, says Oholei Torah Mashpia Rabbi Michoel Seligson. At his suggestion, CrownHeights.info presented a weekly feature during the summer months: a short thought of the Rebbe on tznius, as compiled by Rabbi Seligson. Late 1969 much focus was placed on a new style of dress. On Simchas Torah the Rebbe had already addressed the issue of tznius at length. “I have noted on various occasions regarding the necessity of strengthening tznius. However, taking into consideration the present situation on this topic, I find it necessary to come out with a highly urgent appeal. . . Already from the reward assured in the Torah, in the Talmud, and the Zohar, and from the words of our sages OBM, relaying how Jewish women over the course of different generations merited through tznius to exceptional G-D’ly blessings, not only for themselves but also for their husband and children and grandchildren – makes it easier to understand the importance and meaning of tznius. The above speaks for itself…. if a skirt is not mid calf it has little chance to cover the knees while sitting, that is how many communities came to the 4″ conclusion. try it and see for yourself. Thank you for doing what needs to be done! The fact that you have so many negative comments proves that your are doing something right! It is sad that after learning Tanya and the Rebbe’s sichas, mamorim etc there are still some out there that have their nefesh habahamas working overtime. Just say a perek Tehillim for them and Hashem will grant you hatzlocha in this major undertaking! At various occasions, I have emphasized the necessity of strengthening the areas of Tznius. However, taking into consideration the state of affairs, I find it indispensable to come out at this time with a calling of utmost urgency on this matter. It is evident from the reward that is guaranteed in the Torah, Gemara and Zohar, for the adherence of Tznius, and from what our Sages of Blessed Memory recount of Jewish women in previous generations, who have merited exceptional divine blessings as a reward for their Tznius. They merited these blessings and so did their husbands, children and grandchildren. Hence, it is simple to understand the significance and implication of a Tzniusdike comportment. There should be an effort to persuade all those who do understand the virtues of Tznius and are stringent. They should excersize their duty upon their sisters to influence them verbally and even more so as a living example by strengthening the matter of Tznius in their homes as well as within their circles. It is high time that Jewish Women and Girls should sense their Jewish pride and their liberty from the devoid and hollow “fashions,” which are false and misleading. They have no substance to them apart from the financial pursuit of those who have an interest in it. May they and their husbands merit Yiddish Nachas from all their descendants along with health, prosperity and happiness for a good long life. And what is especially relevant to women is tznius, … But, all the aforementioned shall be performed in a manner of joy and trust since the creator observes and assists each person in all their inyanim. “By improving in her ways of modesty, a woman is assured good health, sustenance, and much nachas from her children and grandchildren. Letters of the Rebbe, Vol. 8, pg. 204. A chossid in yechidus asked the Rebbe a question regarding dress length. The Rebbe: “The longer, the better and more pleasing. I do not want to standardize a size as to how long it should be. Let the local Rabbonim make the decision. One Rav may require an additional centimeter; another may advise to add more centimeters. But in my opinion it is definite that the minimum garment length while standing, should be long enough that the knees are fully covered when sitting. Not because a non-Jew in France decided on a new dress style, do Jewish girls need to adhere and follow it. (Hiskashrus # 48, page 11 – Korach 5755/1995). yiras shomayim is tznius and taharah). Based on the words of כ”ק אדמו”ר שליט”א concerning the adherence to Tznius, as stated in Shulchan Oruch או”ח סימן ע”ה, it is not permitted to mention anything of kedusha in the presence of an exposed טפח, even from a little girl, starting from the age of three years old. We therefore request of all Anash not to bring even your young daughters to the Beis Medrash without proper coverings. Reb Yaakov Yehudah (“JJ”) Hecht was once with his family at yechidus and one of his daughters had her hair down (untied). “V’yehi rotzon, that the desire of the Almighty should bring success in their hands to be inspired for good activities in this direction, illuminated with Chassidic light and energy, in strengthening tznius and publicizing it in their close and distant environment – as one. The Rebbe concludes: “The explanation of our sages is well known that tznius is a sacred matter. It is a special mission given to the Jewish woman, who is referred to as the ‘Akeres Habayis’ (the foundation of the home), akeres of the Jewish home – individually and collectively. Equal to the responsibility and mission is their great reward, as stated in the Zohar, to draw down blessings in the home and family – blessings [converted] to wealth, children and grandchildren. Not to a school director to impose on students AND parents. Chutzpe, disgusting approach and a chilul chabad. בעיא איתתא כו’ גודל השכר בזה. It’s about time the lack of Tnius should be brought to everyones attention The woman and girls with this problem in Crown Heights are an embarasment to the world Chasidim . How disgusting seeing a woman walking next to her bearded husband while wearing leggings with tiny or non existing socks , cut out neckline,long shaitels, A skirt on top of leggings that gets tighter and shorter by the day to give the impression she wears pants and top.So , I say KOL.. HA. KAVOD.. TO THIS SCHOOL I hope they won’t accept girls from such homes where mother’s are. Not a Dugmah..Chaya.. to their daughters just contrary to the values that the scool works so hard to convey to them. Shame on all with the negative comments. Try to admit you are not conforming to Chasidishe standard of modesty and make an effort to improve. The sooner you do it , the better for everybody The yiden in Mitzraim did not change their levush and they were zoche to the Geulah. Maybe you’ll be the ones to help us reach that goal too. Tznius is something that should be taught and come from within – not imposed. I honestly don’t care if you enforce tnizus in your own radical way, many other sects do that. This will not make the girls “behave better”, it will only put more pressure and repression on them. Adding more and more rules, every year. Your repression only leads to more ppl going off the derech. And when you fake-cry at farbrengens for the ppl who fryed-out, take a good look at yourself in the mirror and you’ll find the cause. Vehu rachum yechaper ovoin. May u do tshuva from your imposing ways. Kol HaKavod to Rabbi Gurary. Tznius is the most important Mitzvah of the Jewish woman. Just because the Misora of the Torah was handed through the generations via our Talmidei Chachamim, starting with Moshe Rabbeinu, who were all men; does that mean that women shouldn’t listen to them? Finally some doing something this is long over due . I worked at that school for almost 2 years and I’m hoping that the same exact standards will be expected of the Teachers/Staff. When I worked there, long Sheitels on teachers were the norm and everyday felt like a fashion show. If you place all the blame and point fingers at the mothers, just remember you are pointing 4 fingers back at yourself! Finally somebody is doing the right thing about one of the most important halachas in Shulcan Aruch. Tznius to women is like learning Torah for men (Gedolei Israel). To acquire Yiras Shamayim, men need to learn Torah and women to dress according to Halacha.